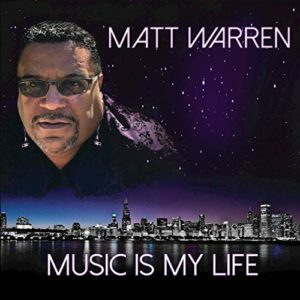 A danceable drumbeat and repeated talking vocal runs over Richard Meyer Junior’s pumping piano and some tight horns from Ron Haynes on “How Do I Love Thee” the opener of Matt Warren’s new release, Music is my Life. This is the Chicago house music pioneer and Platinum Award-Winning producer/engineer’s first release of his own music in a decade. And this first tune gets us up and moving for sure. There’s more upbeat percussion on “Catch Me If You Can (Main Mix).” This one with more sly sliding horns and a pumping bass; it’s big time get up and dance stuff with an effective repeated sung title. “Going Deeper” has got a wild drum track with some wailing organ (I so dig organ in a dance tune), while “La Rose” sees Frank Schabold really stepping up the bass playing (not that he’s not brilliant throughout) and some wild vocalizing over the top bringing us deep into foreign lands and slightly dangerous byways. Again the percussion build and the production are spot on here as they are throughout Music Is My Life. A slightly slower blurbing programming beat informs “Sometimes,” all under teasing female vocals. It’s a hypnotic drone of a tune while “The Dark Storm,” the last song here, begins with a simple piano line and stays that way, mainly. This is the most interesting, and atypical song to everything else on Music is my Life, a piano instrumental. What a mind-blowing ending to all the dance beats and horns that preceded it.